The full 2017 Louder Than Life music lineup also features: Halestorm, Gojira, The Pretty Reckless, In This Moment, Eagles of Death Metal, Thrice, Hollywood Undead, Of Mice & Men, Steel Panther, Falling In Reverse, Sleeping With Sirens, Nothing More, Beartooth, Starset, We Came As Romans, Lacuna Coil, Miss May I, Radkey, Bleeker, While She Sleeps, Greta Van Fleet, Fire From The Gods, '68, Badflower, He Is Legend, Black Map, DED, Through Fire, Palisades, and BITERS. Rob Zombie said, "The Zombie and his horde are ready to throw down and get weird at Louder Than Life. Zombie and Ozzy together again! Dig it! See you in Louisville!" "It's been way too long since we've played Louisville, and we're stoked to be coming back in a big way to join friends Prophets of Rage, Thrice and the rest of the amazing lineup at Louder Than Life," said Tim McIlrath of Rise Against. 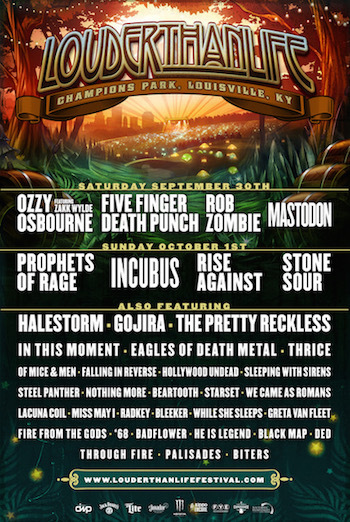 Mike Einziger of Incubus commented, "We're excited to be returning to Louisville and playing the Louder Than Life festival on October 1st with our friends, Prophets of Rage and all the other great bands on this amazing lineup. It's going to be a great show and we can't wait to see everyone!" Danny Wimmer, founder of Danny Wimmer Presents added, "I'm excited to have Prophets of Rage close out the festival. After seeing them in a small setting in LA, I couldn't wait to get them added to our festivals this fall. Tom, Tim, and Brad from Rage Against The Machine, along with Chuck D and DJ Lord from Public Enemy and B-Real of Cypress Hill, playing the hits that made Rage one of the most iconic bands in history is a special thing to see. Adding that along with Ozzy Osbourne, Incubus, Rob Zombie, Five Finger Death Punch, Rise Against, Stone Sour…how could you miss this lineup? And after an incredible run with Gojira this spring I can't wait for them to come to Louder Than Life as well. I'm beyond excited for this year's festival. It's a can't miss experience." Featuring the world's TOP bourbons including Angel's Envy, Basil Hayden's, Benchmark, Buffalo Trace, Bulleit, Eagle Rare, Evan Williams, Four Roses, Jim Beam, Knob Creek, Maker's Mark, Michter's, Old Forester, Larceny, Town Branch, Wild Turkey, Woodford Reserve and more! Louder Than Life will also feature interactive music, food and beverage experiences including: • Artist autograph signings and beverage sampling at the Monster Energy Hospitality Rig • Jack Daniel's Experience • Zippo Encore Music Experience • FYE Fan Experience • Bourbon World presented by the Louisville Courier-Journal • The Music Experience • It's Miller Time VIP Lounge and Sports Bar • Heavy Tiki • The Big Easy Boil • Rock & Roll BBQ • Love & Fire (open flame cooking) • Dyin 2 Live / Fxck Cancer • and more to be announced in the coming months. Sponsors for Louder Than Life include Monster Energy, USMC, Fxck Cancer, FYE with Roadrunner Records, Razor & Tie, Century Media and Another Century, Jack Daniel's, El Jimador, and Zippo, with more to be announced.